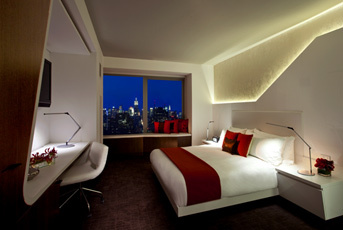 #OWS … We don’t need no stinkin’ tents, especially when you can stay in a NYC $700 a night hotel room. Well what do you know, isn’t this what Nancy Pelosi would call “astro-turf”? I wonder how the 99% OWS protesters feel about the privileged 1% wannabe’s in their midst? Who would want to stay with the riff-raff and be among the unwashed, when they can use their privilege of the 1% and stay at the W Hotel Downtown. How absolutely typical is this of Libs? While the unwashed, brainwashed minions live in the filth, disease, urine and crime of the Occupy camps, the organizers are living la vita loca in luxury and life styles of the “Rich and Famous”. Hell no, we won’t go — unless we get goose down pillows. A key Occupy Wall Street leader and another protester who leads a double life as a businessman ditched fetid tents and church basements for rooms at a luxurious hotel that promises guests can “unleash [their] inner Gordon Gekko,” The Post has learned. Shocker, the OWS protesters are hypocrites. Does it really get any more pathetically hypocritical than this? Seriously. You claim to be a part of a movement where you say you represent the 99%, yet you stay in the very entity that you say you are against. As states at Michelle Malkin.com, the W chain is owned by Starwood Hotels, which closed on Wall Street at 49.08 on Friday. I am guess that these guys will not be showing up for their free Turkey Day vittels and fixings. Today in Boston, Harvard Univ. looking at measures to remove “Occupiers” from Campus grounds. Also Boston Judges doing the same to issue eviction notices from those on Boston’s “Greenway” claiming they will stay in their tents all throughout the Winter. Hasn’t this gone way overboard? Perhaps their time should be spent focusing on the upcoming election vs. making themselves look like idiots in public and occupying nothing but space. Talk about a waste of LE resources as well in these times of budget deficits—-IS THIS REALLY NECESSARY, People? Get a JOB, and GET A LIFE. Oh, that’s right—-can’t really blame them there—THERE ARE NO JOBS. Thanks to PRESIDENT OBAMA!